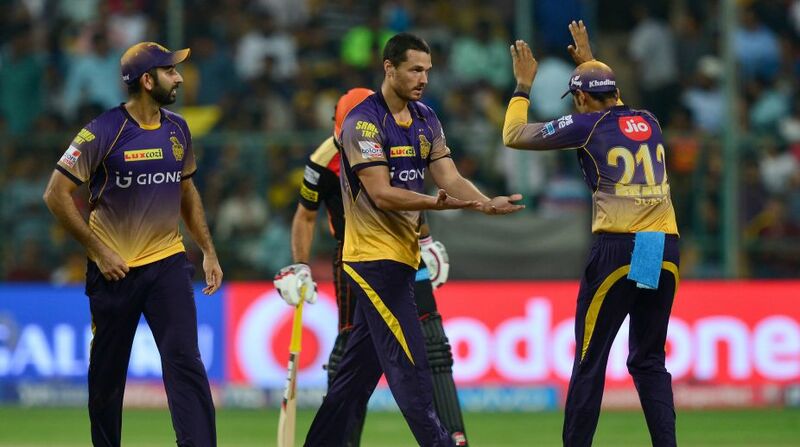 Coulter-Nile credited fellow KKR pacers Umesh and Boult for giving him pointers which helped his bowling. Kolkata Knight Riders pacer Nathan Coulter-Nile said there is a need to have a fresh look at the IPL rules after a 1.30 am finish to their rain-hit IPL eliminator against Sunrisers Hyderabad here. KKR survived a rain scare to notch up a seven wicket win via Duckworth-Lewis method after they were set a revised target of 48 runs from 6 overs in the rain-truncated eliminator on Thursday. “Well, no one really got nervous untill when they went out there for the last look at about 12:40am. It sorted of looked like I didn't wanna play. I think there is so much time, rules probably need to be looked at, I mean its 2am, you can't be playing cricket at 2 o' clock. But I wasn't nervous at all. There was so much time, we had to get on,” he said after the match. Coulter-Nile returned with a three-wicket haul, which included a brilliant 19th over where he bagged the wickets of SRH's Vijay Shankar and Chris Jordan and conceded just three runs. The Australian seamer credited fellow KKR pacers Umesh Yadav and Trent Boult for giving him pointers which helped his bowling. “I think I bowled the seventh or eighth over and they said 'Look, cross-seamers into the wicket, throw them hard' and you really rely on your teammates to give you some pointers on what to do,” he said. Coulter-Nile said the wicket of SRH skipper David Warner by Piyush Chawla was the turning point of the match as the Australian is the most devastating batsman in the world. “Piyush removed Warner, that I thought was the turning point. He is that kind of a bloke who can turn a 130 into a 150 or 160. That started with the first over,” he said. Coulter-Nile said KKR went for the kill right from ball one for the reduced 48-run target as a strategy because 129- run target was not going to be an easy one to chase down, given the slow nature of the wicket here. “Well, 130 was a par score but it was a difficult wicket definitely. The cross-seam was holding up and the slower ones were getting a little bit of grip,” Coulter-Nile told reporters at post-match press conference here. “So, it was tough to play and once the weather came in, it got a lot easy to bat. I think the balls skidding on, and once the ball's wet it actually skidded through. There wasn't a lot of turn or anything like that so I thought maybe 140 … 10 runs make a lot of difference,” he said. KKR had to wait endlessly for the rain to stop to know the fate of the match. Talking about the anxious moments, he said: “When it was raining, we were quietly confident because 12.50 am was the cut off time. It kept raining and raining. The covers kept coming on and off. So, we were getting twitchy. “KKR will now play MI on Friday at the same venue and will be praying that the rain gods will stay away,” he said. Kolkata put up a brilliant show, first by restricting Sunrisers Hyderabad for 128 for seven, with a bowling attack headed by Coulter-Nile and Umesh Yadav, who picked up three and two wickets, respectively. They then got the required 48 runs with four balls to spare in the rain-truncated six over run-chase, but not before losing three wickets in first two overs, including the classical Kane Williamson. Coulter-Nile said KKR batsmen batted well and knew that if one out of ten gets going, the game could be won, and that's what happened. “It was not a big target, but on that wicket you really never know. You got 10 wickets in hand, there is six overs, there is no point to defend. If the top six batsmen go hard and one of them comes off then you win the game. “So, I think we batted well. Of course the run-out was a bit silly but everything else just fine,” he said.